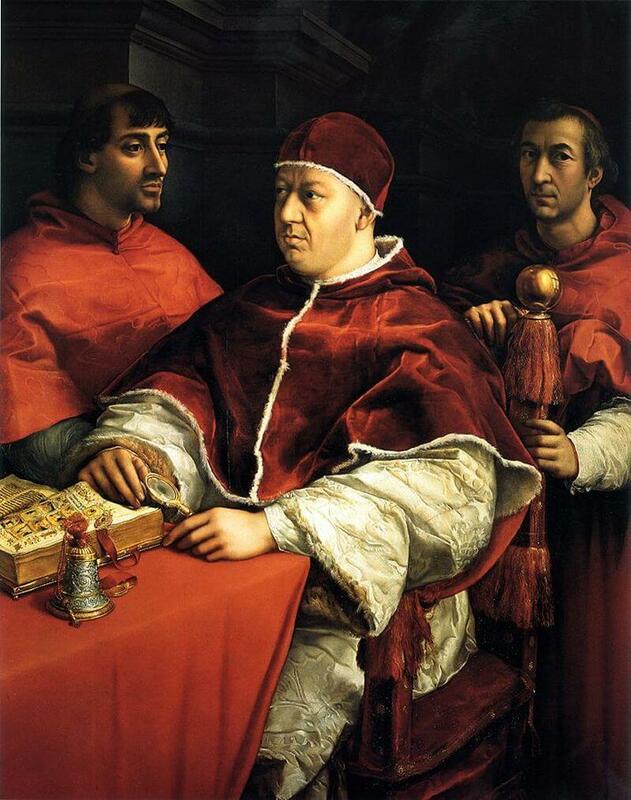 The portrait of the pope was made to represent Leo X, who was unable to move, to the wedding of his nephew Lorenzo Duke of Urbino with the French noblewoman Madelieine de La Tour. Already at that time the painting aroused much admiration especially for the meticulous reproduction of detail and light. Not to mention the reflection on the knob of the papal chair in which you can recognize the rest of the room. Leone X is sitting at a desk covered by a red cloth, intent on reading a manuscript. Behind him are his cousins cardinals Giulio de' Medici (the future Pope Clement VII) and Luigi de' Rossi. The portrait is spread diagonally and not in profile or from the front as was tradition. Besides the gaze of the characters look all in different directions, giving plenty of space width to the painting. The colors refer to the "Red Symphony": from purple to scarlet.